Starbucks Malaysia Offering Buy 1 Free 1 Tiramisu Frappuccino or Tiramisu Chocolate Chip Frappuccino from 20 August 2014 until 1st September 2014. For the past few days, I saw a awesome post from Starbucks Malaysia. They promoting Buy 1 Free 1 Tiramisu Frappuccino or Tiramisu Chocolate Chip Frappuccino. This is not a joke or scam! I have try it and redeem it too. To redeem Buy 1 Free 1 is really easy. 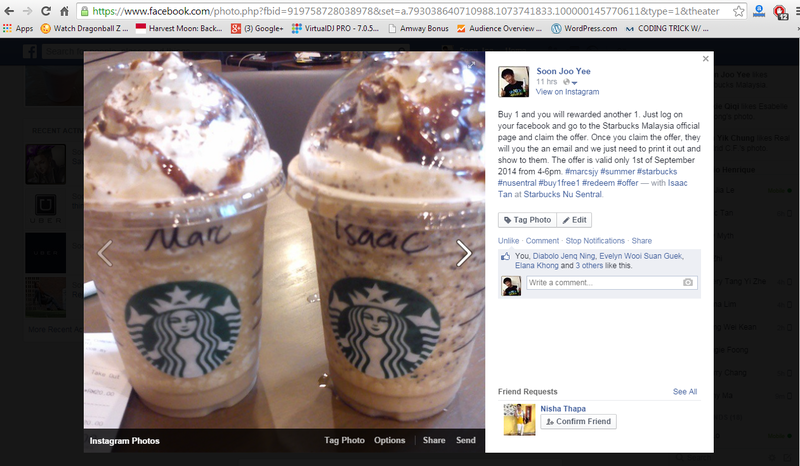 First of all, you just need to like Starbucks Malaysia Page. After that, you just need to click on Starbucks Offer Link and it will show something as below. Starbucks Malaysia Offering Buy 1 Free 1 Tiramisu Frappuccino or Tiramisu Chocolate Chip Frappuccino. 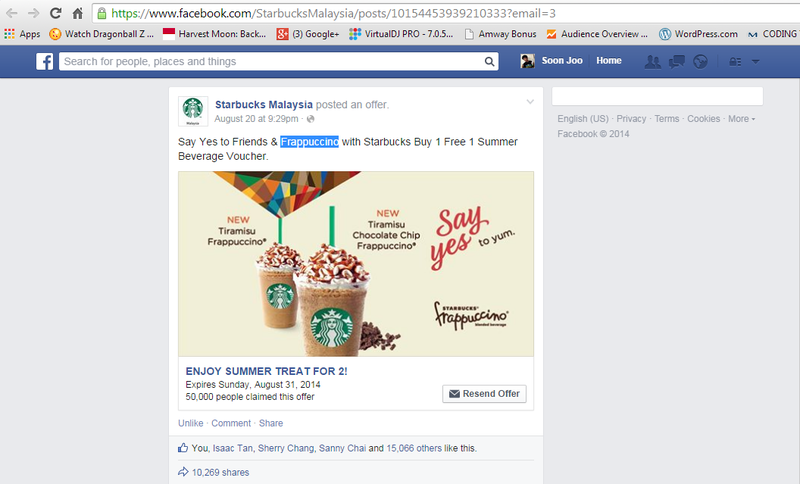 After that what you need to do is Like the post and also Share the post so that more people will know about this awesome offer from Starbucks Malaysia. Just Click on the Claim Offer or Resend Offer is still available. Once you clicked, they will send you the offer to your email. So please do open your email to redeem it. The email that you will receive will be something like this. The email that send from the Starbucks Malaysia. What you need to do is to PRINT IT OUT and go to your favourite or nearest Starbucks Malaysia to redeem it. Don't forget that the offer is start from 4.00pm to 6.00pm until 1st of September 2014. Here is what I have redeem for my Starbucks. Thanks you for reading. Time to redeem this awesome offer from Starbucks Malaysia. Tou have make my August so awesome.